Celtic manager Brendan Rodgers almost joined Europa League rival Roberto Mancini at Manchester City in 2009. Rodgers' side meet Mancini's Zenit St Petersburg in the last 32 after being paired together in Monday's draw. And he revealed he was close to joining the Italian's backroom team before taking the manager's job at Swansea City. "I was in talks with Manchester City about maybe going back there as a first-team coach," said Rodgers. "I was rejected as a manager at Reading and was in between jobs and I didn't think I was going to get a manager's job. "I spoke to the club, all went well and I flew out to Milan to meet Roberto. "We had a nice chat and it ended up that not long after that I got the job at Swansea as a manager." 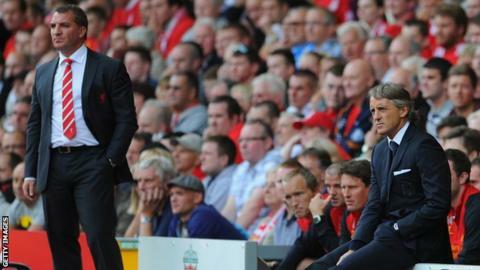 Rodgers enjoyed success as Swansea, guiding the Welsh outfit to promotion to the Premier League in 2011, and as a result was made Liverpool manager in 2012. The Northern Irishman was sacked by the Anfield club in 2015 and became the Celtic boss a year later. Mancini won the Premier League title with Manchester City but was sacked in 2013, after which he has had spells in charge of Galatasaray and Inter Milan, before moving to Russia. Celtic host Zenit on 15 February and travel to Russia for the return seven days later. "We have come across each other since, he is a good guy, nice guy, but I haven't seen him for a couple of years now," Rodgers added.